Flamingo Holiday Flats - St Lucia Accommodation. 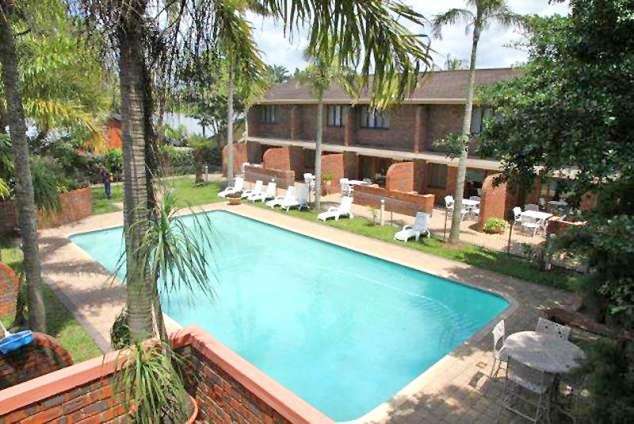 Each unit is fully equipped and furnished for up to four people, including selected DSTV channels, undercover parking, private BBQ and outdoor area, safe in room as well as a complimentary daily cleaning service. All units are ground floor overlooking the swimming pool. Flamingo is set in the heart of St Lucia, walking distance to all local shops and restaurants. The holiday units are fully equipped and serviced daily to ensure a stress free stay. Hippo and Crocs are found in abundance with close access to inland game reserves as well as superb whale and dolphin spotting in our local oceans. Each year between November and February turtles arrive to lay eggs on specific spots along the beach. In addition to being a habitat for Nile Crocodiles, Hippo, Rhino, Buffalo, Leopard and Elephant, St Lucia also boasts a host of water birds including Pelicans, Kingfishers, Geese, Ducks, Heron, Fish Eagles, Flamingo and Storks. Lake St Lucia´s eastern shores are comprised of some of the highest forested dunes in the world. Take a sunset cruise on the Lake, try one of the numerous game drives, night drives kayaking or hiking trails, explore our beautiful pristine beaches, visit the informative crocodile centre or just relax by the pool. Visit nearby Cape Vidal and Mission rocks with the offshore reef providing safe snorkelling and swimming. There is also a Whale watching tower providing excellent views of passing marine mammals. Whatever you choose to do a stay at Flamingo Resort is sure to re charge your batteries in this beautiful part of South Africa. Why not contact us now to escape from the frustration of city life and visit beautiful St Lucia where you are one with nature! 420 page views since 08 Nov, 2018. Last updated on 08 Nov, 2018.